Wow, what a bargain and a pen that actually writes well! 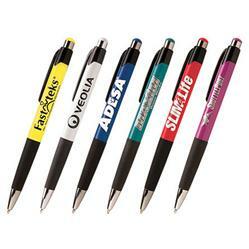 This fun, inexpensive pen is so colorful and can help brighten up your tradeshow booth and your customers day. Guaranteed, patented smooth writing ink. Perfect customer appreciation gift and if you have a retail store no problem if someone takes it at $.44 each! FREE 24 HOUR RUSH SERVICE! Production Times Available: 5 business days standard. For free 24 hour rush, please inquire. Blue and Black Ink available, Blue ink default unless otherwise stated. You just found an office favorite here at Adco! My name is Tom and this is a great pen for the money! It has a durable cartridge, a rubber grip, and a nice imprint area to work with. I have many customers that have been re-ordering these pens for years now. A great find - and a strong recommendation!